Transmedia storytelling “represents a process where integral elements of a fiction get dispersed systematically across multiple delivery channels for the purpose of creating a unified and coordinated entertainment experience.” (Jenkins, Transmedia). There is no one source where you can get all of your information on a media property, as the sources can expand into books, video games, movies, comics, etc. Two elements of transmedia story telling that I have chosen are the multiform story, and negative capability. The multiform story, describes “a written or dramatic narrative that presents a single situation or plotline in multiple versions or perspectives.” (Murray Page 30) Negative capability can mean “the reference to characters, events, or places that exist outside of the story, and rely on the imaginations of the audience to fill in the gaps until the author can return to those ‘seeds’ for later extensions” (Jenkins, Gender). Both of these are important because the multiform story helps us see situations from new points of view, that may offer information we were unaware of before, and the negative capability can bring back the audience with more questions, hoping that they’ll get answers either within the show, webisodes, comics or games. The media property that I have chosen is The Walking Dead. The first episode of the AMC TV series which showcased back on October 31st of 2010 , begins with Rick waking up after an unknown period of time, and coming across a locked door that has “DON’T OPEN, DEAD INSIDE.”, which is showcased in this first clip. http://www.youtube.com/watch?v=mDcVj5NmNT4 How that sign appeared, is revealed in the webisode trilogy titled “The Oath.”, which was made on October 1st of 2013. The webisode uses the multiform story, and shows the perspective of two other survivors at the hospital, taking place at an unknown point before Rick wakes up. If it had not been for the webisode, then it would have remained unknown as to who spray painted “DON’T OPEN, DEAD INSIDE” which helped warn Rick after he woke up. This is why the multiform story is important because it helped the audience understand who put up the warning for Rick to begin with. The second element used that connects the webisode, “The Oath”, to the first episode is negative capability. When Rick first came across the sign that said “DON’T OPEN, DEAD INSIDE.”, it provoked many questions such as “How did that sign get there? Why the door is chained shut? Who put up that warning?” If the warning had not been placed, than it would not have provoked negative capability and gotten audiences wondering. It’s revealed through the perspective of Paul, one of the main characters of “The Oath”, that he was the one who chained the door shut, and put up that warning as shown in this clip, http://www.youtube.com/watch?v=2vZREEK6V0U. Without the Oath, the answers to the negative capability of the first episode would not have been answered. Jenkins, Henry. “Transmedia Storytelling 101.” Confessions of an AcaFan. N.p., n.d. Web. 25 Feb. 2014. Murray, Janet H. Hamlet on the Holodeck. New York: The Free Press, 1997. PDF. Jenkins, Henry. “Gender and Fan Studies (Round Five, Part One):Geoffrey Long and Catherine Tosenberger.” Confessions of an AcaFan. N.p., 28 June 2007. Web. 27 Feb. 2014. According to Gunning’s article “Astonishment is an unstable and temporary experience.”(Gunning 41.) . 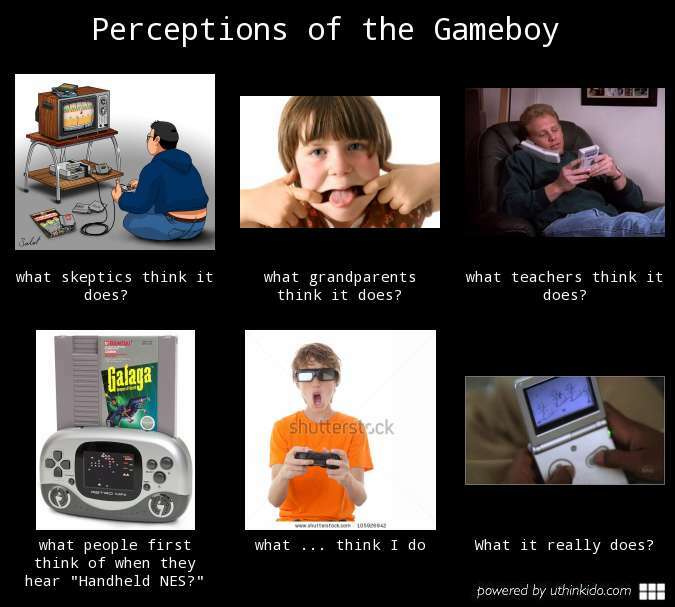 Some assumed by the name “Gameboy” that it would be another console based system, like in “What skeptics think of it?” Yet when the heard the idea of “mobile, handheld gaming; people thought it would be something like taking a large game cartridge and inserting it into the top; like “what people first thought of a handheld NES?” Back when the first Gameboy came out however, people we’re amazed at the mobility and freedom they were granted with the Gameboy. Kids could bring their gaming system with them to school, and they’d be able to play it whenever at their friends. However, “Astonishment gives way to familiarity.” (Gunning 41.) As time went on, people slowly became more and more used to what they were seeing and would eventually tire from it. Slowly, gamers became more de-familiarized, which is taking an object that everyone recognizes, and changing some parts around to make it appear new; even though it’s the same as before with added features. In Gunning’s article, it’s explained that we need to be surprised, since being amazed is not a natural phenomenon. Whenever we come across something that we see every day, or something that seems new with more options; we shrug and move on. Thus, we aren’t surprised at all. Yet, whenever we do come across something that’s actually “new”, our amazement is genuine. Our astonishment will remain genuine, until more of the same is made over and over again, with a few added twists. Game makers resorted to de-familiarizing each new handheld that came out, in order to catch the eyes of customers. They’d take something that gamers were used to, like the Gameboy’s Color for example; add color and then suddenly: it’s a brand new system customer, even though it’s not. Then, the Gameboy Advance was released, which although played better looking games, and had a different design; it was simply an updated Gameboy Color. Eventually, the Nintendo DS came out, and then onto the 3DS. Being as how each new system was made from a previous console, which was used as a stepping stone in order to make their new system; real amazement didn’t come often. When new systems which are not using the schematics from previous systems, get made; then people will be completely fascinated. In the end, the Gameboy first opened the door to handheld consoles. It eventually opened the door to making newer, similar systems. Yet despite slowly being de-familiarized, people still buy the new, descendant handhelds out of finding out what each new system has added on. Gunning, Tom. (2003) “Re-Newing Old Technologies: Astonishment, Second Nature, and the Uncanny in Technology from the Previous Turn-of the Century”. In Thorburn, D. and Jenkins, H.(eds), Rethinking Media Change: The Aesthetics of Transition. Cambridge, MA: MIT Press, pp 39-60. “Game Boy.” Wikipedia. Wikimedia Foundation, 26 Jan. 2014. Web. 31 Jan. 2014.